phpBB is an open source bulletin board forum software that provides a virtual space for discussion among the members of your website. It has a huge variety of features like flat topic structure, sub-forums, forum-specific styles, user groups, group-based permissions, database query and template caching, support for PHP 7, multiple database engines and much more. With phpBB’s extensive features you can create your own forum in a matter of minutes and what’s most important, it’s completely free. 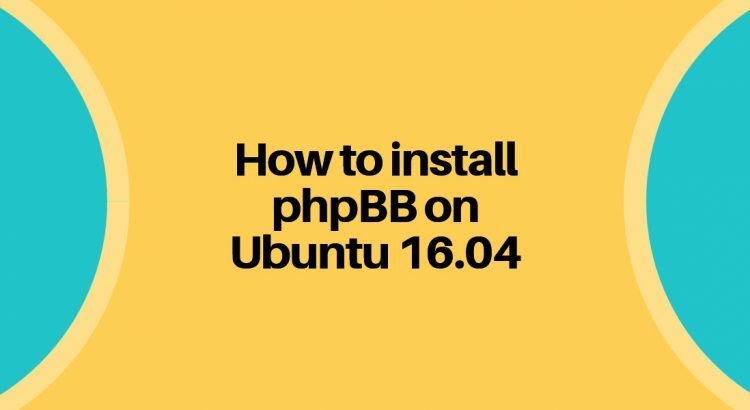 In this tutorial, we will show you how to install phpBB on an Ubuntu 16.04 VPS. Create the database user, make sure to change the password randomgeneratedpassword with your own password. Note: Replace your_phpBB_directory with the directory you installed phpBB in. Using your browser, go to http://yourdomain.com/install or if you installed phpBB in a separate directory http://yourdomain.com/your_phpBB_directory/install. Note: Make sure to use a secure password with at least 8 characters, 1 uppercase letter, 1 special character, and alphanumeric characters. In the next step, you should set up options according to your preference like providing your domain name or whether you would like to force SSL.After this step, you will be taken to the SMTP configuration page, if you don’t have an SMTP server you can leave this page as it is and click Submit to continue. Click Install again and wait for the installer to finish.When the installer finishes installing phpBB you can click the take me to the ACP link and set up your new phpBB installation. That’s it, now you should have phpBB installed on your server. Of course, you don’t have to do any of this if you use one of our Software Installation services, in which case you can simply ask our expert Linux admins to install phpBB for you. They are available 24×7 and will take care of your request immediately.